They say spring is for new romances, and indeed, in April of this year we all fell in love! 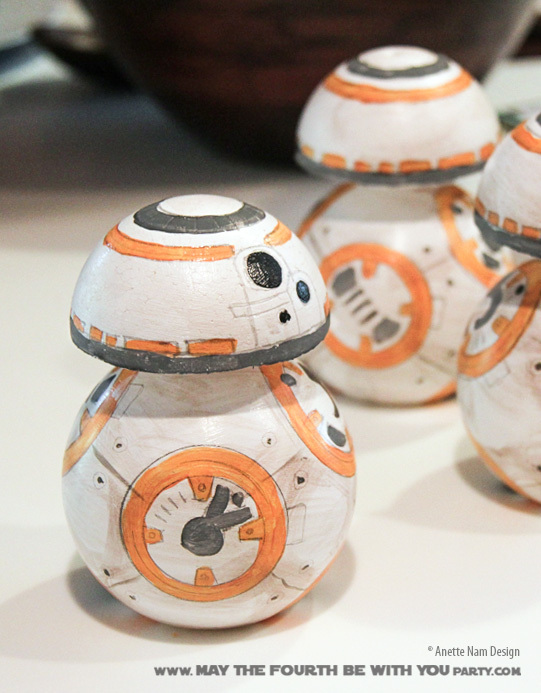 BB-8 is one of the cutest movie character to come along in years. And of course we all really, really, really wanted one of our own! 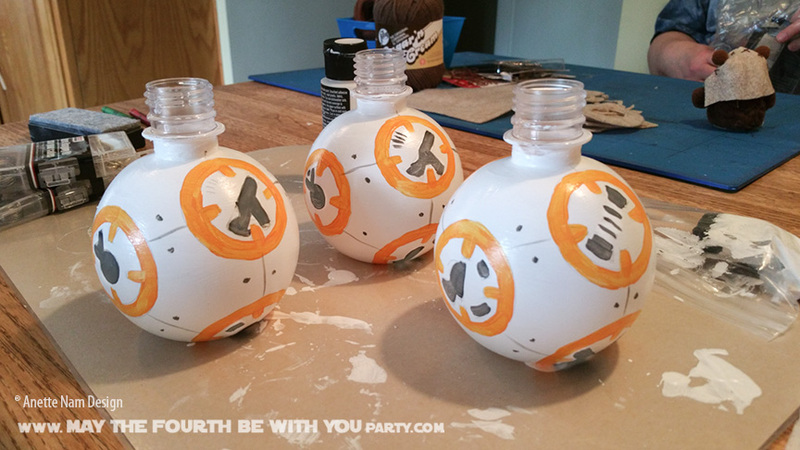 Since the lab at M4P is equipped to make any full size robot, as long as it can be built with duct tape… a full-size, working BB-8 was out of the question. However, these M4P exclusive mini-versions were well within our abilities. Before we get started on the DIY part I want to note that we had all kinds of other fun projects going at the time we made these. Jedi Master Heidi was making Ewoks, a votive, and an R2-D2 sign, and I was making Wampa Cookies. So don’t get confused by the seemingly unrelated objects in the backgrounds of the photos! Remove plastic wrap around bottles. Cut foam ball in half with the saw. 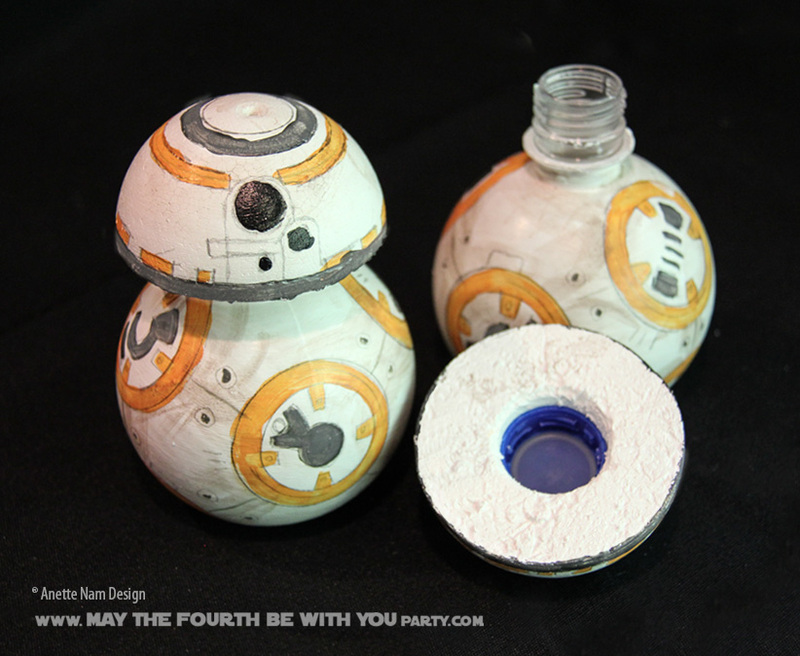 Carve a bottle cap-sized hole in the middle of the inside of the foam ball. Depending how large the hole in your foam is, you might need to glue the cap in place. Using circle template, draw the designs in pencil. Paint the orange, grey (mix black and white) and black details. Let dry. Add pencil marks on top of paint, if needed, to simulate those de-bossed edges. Mix orange, black and lots of water. 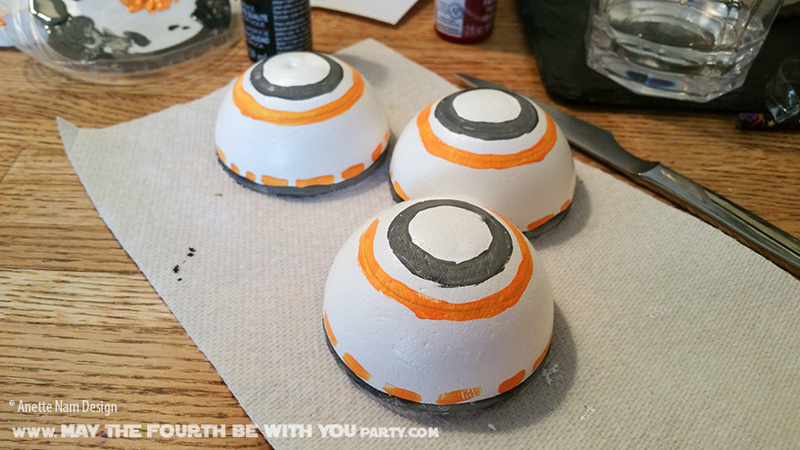 Dry brush some “battle fatigue”, so your BB-8 looks a bit dirty and dingy. I did not use paint that is safe for food. I have been told it can be ordered online, but I could not find in local craft stores. Recently, I did a check online, and there are lots of paints called “non-toxic” but I found nothing that was considered food safe. For our party, the water was in the bottles for just a few hours, so I wasn’t really worried about toxins seeping in. However, if you plan on using your bottle regularly, then definitely look for the the food safe paint! 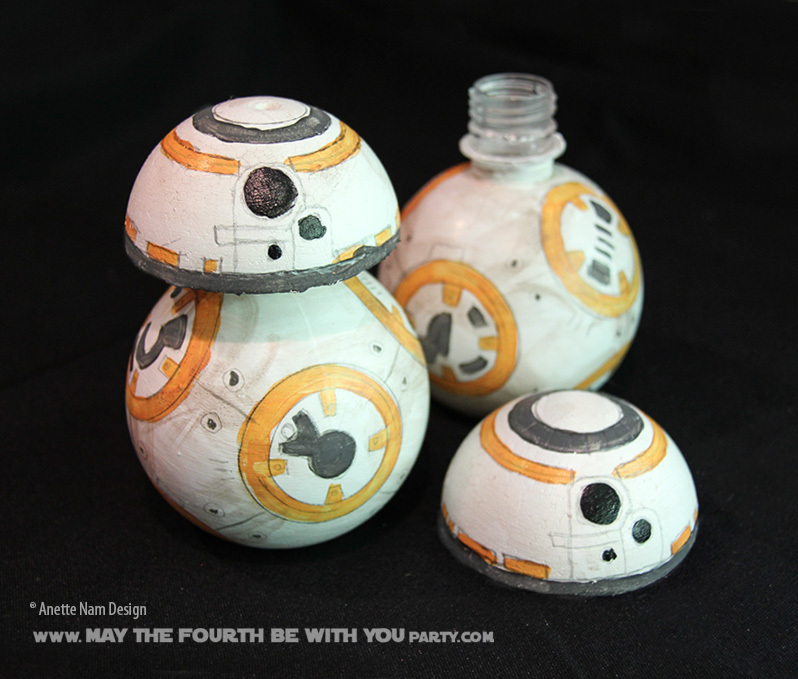 There are many more images available of the BB-8 now, than there were when we made these in April. It seems like the detailing is silver, not grey. So feel free to customize your design!